The present work is an analytical exposition of the theory of knowledge as propounded in the Dinnaga-Dharmakirti tradition. It expounds the Buddhist theory of knowledge in its totality, comparing it with other schools wherever necessary. Buddhist thinkers unanimously uphold the view that there are two kinds of objects of knowledge, namely, the unique particular (svalaksana) and the generalized image (samanyalaksana) . Unique --'e particular is discrete and instantaneous being. It is unique particular in the sense that it is neither identical nor similar to other unique particulars. It is the only objective real (paramartha sat) . As distinct from unique particular there are objects that are constructs iof our intellect and that are in the form of generalized images. They are subjective in origin but intersubjective in nature. To make the logical issues more intelligible to readers, a basic text, "Nyaya Pravega" is given as an appendix of the work. The text of "Nyaya Pravesa" is generally ascribed to Dinnaga, a pioneer thinker in Buddhist theory of Knowledge. For centuries it has been studied as a manual of ". the Buddhist theory of knowledge in India, Tibet, China, and other countries. It provides a foundation to the famous Buddhist art of debate (vada-vidhi) . S. R. BHATT is Senior Professor of Philosophy at Delhi University. His research interests include Indian philosophy, logic and epistemology, social and political thought, and philosophy of religion. He has published numerous scholarly articles and seven books, including The Philosophy of Pancaratra (1968) and Knowledge, Values and Education (1986). ANU MEHROTRA is Senior Scholar of Philosophy at Delhi University. Her research interests includes Indian Philosophy, logic and epistemology, philosophy of religion, and social political thought. She has published scholarly articles on Nehru and Buddhist Philosophy. When Buddha Sakyamuni attained enlightenment beneath the Bodhi tree more than two and a half thousand years ago, his achievement was not only the result of having reached the peak of meditative stabilisation, of having brought great compassion to fruition, but also of clear analytic thought. The lucid simplicity of his subsequent teachings are ample evidence of this. And indeed he encouraged his followers to regard even his own advice in the same rigorously critical light. Thus, the study of logic and the nature of knowledge have been crucial to Buddhist tradition from the outset. These disciplines continued to develop and flourish in India after the Buddha's passing away, reaching their acme in the works of Vasubandhu, Dinnaga and Dharmakirti, which were to become seminal to studies in the great monastic universities, such as Nalanda and Vikramasila. And it was this tradition of acute logic and analysis that was transmitted and preserved in Tibet for more than a thousand years, where it was employed not merely to challenge the views of others but to ensure the clarity and authenticity of one's own view. Therefore, I am delighted that two distinguished contemporary Indian scholars, Dr. S.R. Bhatt and Dr. A. Mehrotra, have written the present book on Buddhist Epistemology, including an English translation of the "Nyaya Pravesa." This valuable work sheds light on abstruse topics and will allow readers to gain a clearer appreciation of the depths of Buddhist knowledge. The present work is an analytical exposition of the theory of knowledge kinds propounded in the Dinnaga-Dharmakirti tradition. It expounds the Buddhist theory of knowledge in its totality. 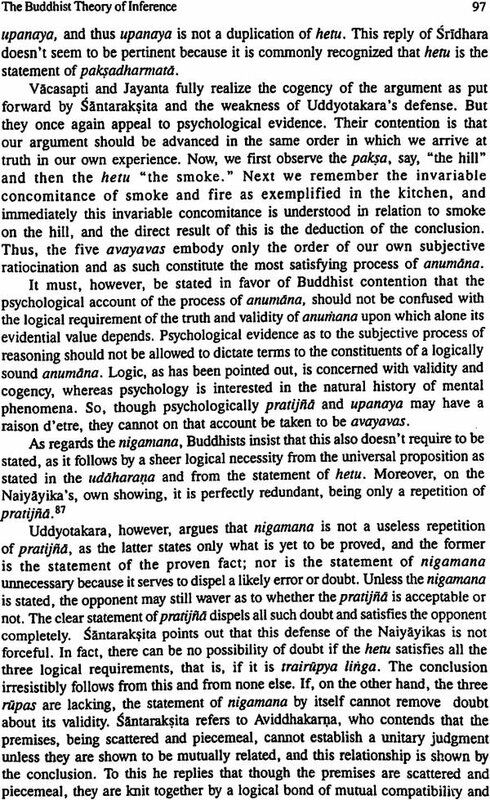 Buddhist thinkers unanimously uphold the view that there are two an kinds the of objects of knowledge, namely, the unique particular (svalaksana) generalized image (samanyalaksana). Unique particular is discrete and instantaneous being. It is unique particular in the sense that it is neither identical nor similar to other unique particulars. It is the only objective real (paramartha sat). As distinct from unique particular there are objects that are constructs of our intellect and that are in the form of generalized images. They are subjective in origin but intersubjective in nature. On the basis of the preceding analysis Buddhist thinkers emphatically maintain that since there are only two kinds of objects of knowledge, there are only two kinds of knowledge (pramana) namely, perception (pratyaksa) and inference (anumana). The unique particular is amenable to perception only, whereas generalized image is known through inference only. By implication, unique particular can never be known through inference and generalized image can never be known through perception. Thus, each of the two types of knowledge has its own separate and distinct sphere of operation. In the following pages is a discussion of Buddhist theory of knowledge, comparing it with other schools wherever necessary. To make the logical issues more intelligible to readers, a basic text, "Nyaya Pravesa" is given as an appendix of the work. 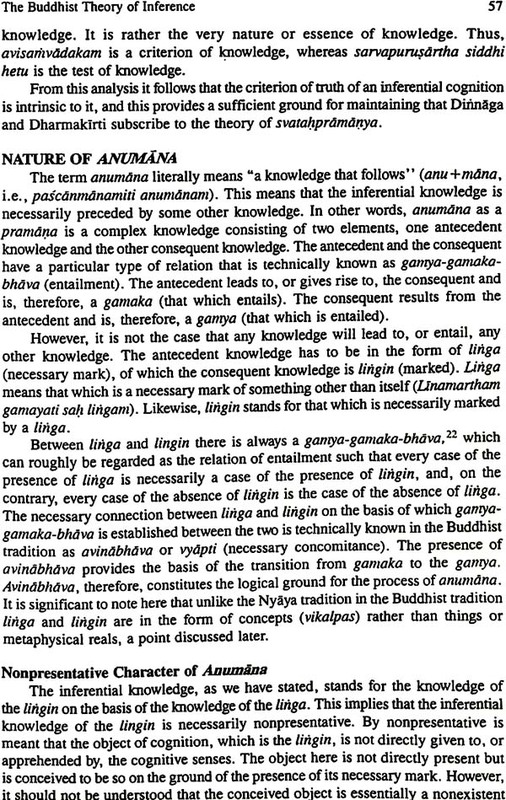 The text of "Nyaya Pravesa” is generally ascribed to Dinnaga, a pioneer thinker in Buddhist theory of knowledge. 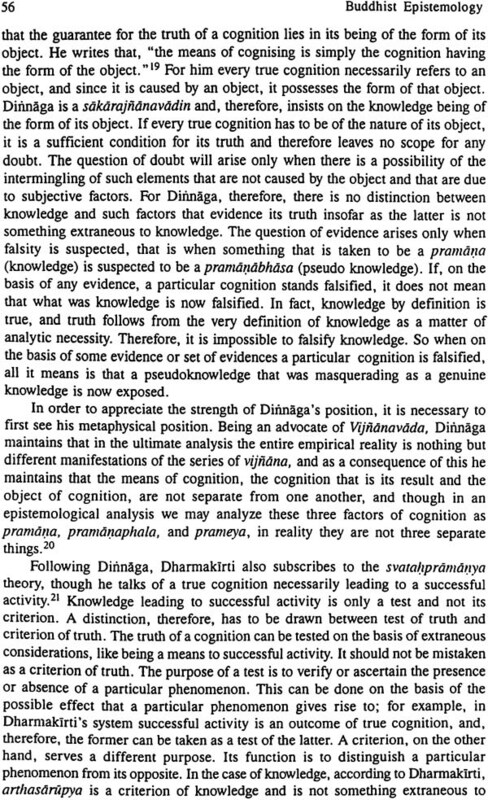 Dinnaga provided a solid footing to Buddhist epistemology and logic and gave it a distinctive character. He has been regarded as the father of Buddhist epistemology and logic in particular and of the entire medieval Indian epistemology and logic in general. There are several works composed by him in this area, among which "Pramaria Samuccaya" and "Nyaya Pravda" are most important. "Pramana Samuccaya" is not available in its complete form, even though some of its chapters have been restored from Tibetan and other sources. However "Nyaya Pravesa" is available to us in its full form. An attempt has been made here to translate it in English for the benefit of English language readers. The text is presented here in Roman script with a view to have wider readership. Explanatory notes have also been provided to clarify some knotty points. "Nyaya Pravesa" is a classical work pertaining to the modes of knowing and reasoning in the Buddhist tradition. For centuries it has been studied as a manual of the Buddhist theory of knowledge in India, Tibet, China, and other countries. It provides a foundation to the famous Buddhist art of debate (vada-vidhi). There are several Tibetan and Chinese commentaries and sub-commentaries on "Nyaya Pravesa" apart from the ones in Sanskrit. This accounts for its significance and popularity among classical scholars. In a cryptic, but succinct, manner "Nyaya Pravega" presents Dinnaga's views on the nature of perception and inference and their fallacies. It also elaborately discusses the modes of argumentation and refutation along with their fallacies. We are grateful to Greenwood Publishing Group and its staff and to Dr. Hoffman who introduced this work to Greenwood. Our thanks are also due to Indian Council of Philosophical Research for providing financial assistance for the preparation of the work. DICHOTOMY OF SUBSTANCE AND NO-SUBSTANCE ONTOLOGIES The varied and multifaceted Indian philosophical thought is characterized by two broad philosophical tendencies that are antithetical in nature but both of which can be traced in germinal form to the Upanisadic thought. 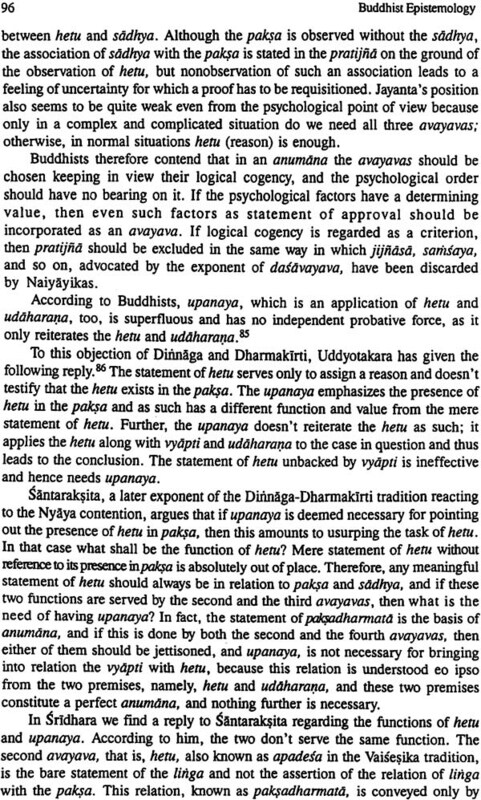 One tendency, which can be termed "atmavada" or "substance ontology," has been dominantly presented in the so-called astika systems, the culmination of which is found in the Advaita Vedanta. The other tendency, which is popularly known as "anatmavada" or "no-substance ontology," finds its advocacy and manifestation in Buddhist thought. The basic contention bifurcating the two tendencies is the view regarding the ontological status of permanence and change, both of which, though opposite in nature, are given to us in veridical experience, and therefore both claim the status of reality. The substance ontology advocates the permanence aspect and tries to explain the phenomenon of change. The no-substance ontology, on the contrary, accepts the reality of change alone and explains the experience of permanence as conceptual superimposition. Thus, the history of Indian philosophical thought could be approached in terms of a dialectic of these two divergent tendencies. The substance-ontology revolves around the idea of permanence or abidance as the sole criterion of reality. Accordingly, substance, which alone is the substratum of all attributes and modes, has the sole reality or the primary reality, and the attributes and modes have either an apparent existence or a derivative existence. According to Advaita Vedanta substance, which is a unitary, homogeneous, pure consciousness, alone is real, and all attributes and modes are phenomenal in the sense that they are miyhya (i.e., neither real nor unreal). The Samkhta system and also the Nyaya-Vaisesika and Mimamsa systems, however, assign some reality to change also insofar as matter is regarded as subject to mutation whether in the form of evolution from one mass of matter or in the form of a combination of different elements of matter, thereby producing a different or new complex. But the point to be noted is that even in these schools that display a realistic tendency the primacy of substance and its permanent essence are emphasized. It may be significant to point out that there has also been another tendency in the school of Jainism wherein the exclusiveness of substance ontology and no-substance ontology has been rejected, and equal status is accorded to both permanence and change. Buddhist thought has centered around no-substance ontology. Gautama, the Buddha, who initiated Buddhist thought, was led to philosophizing by an intense longing for the eradication of suffering. He visualized that all suffering is due to `tanha' (longing) and that all longing is due to attachment to the false notion of permanence. He wanted to suggest a way out of the labyrinth of suffering and put forth impermanence or nonsubstantivality as the key to overcoming suffering. The four Noble Truths, therefore, advocate the idea of impermanence and nonsubstantivality as the way to eradicate suffering. The entire reality that is generally understood in terms of matter and consciousness has been understood by the Buddha as a series of changing moments (ksana). The word "moment" is suggestive of the fact that all real or existent is time-embedded. All that exists, exists in time. Therefore, an existence series is identical with time series. The existence series could be physical or psychical or a conglomeration (sanghata) of the two. Every series in itself is also a conglomeration. Material entity is a Physical conglomeration (bhuta sanghata), whereas mental entity is a psychical conglomeration (citta sanghata). A living being is a psychophysical conglomeration. Since the psychical conglomeration is of four types, a Psychophysical conglomeration is named as pancaskandha, consisting of four psychical and one physical conglomerations. The four psychical conglomerations are vedana skandha, samskra skandha, nama skandha, and samjna skandha. The only physical conglomeration is rupa skandha. The existence series, whether of a physical conglomeration or psychical conglomeration, consists of distinct units of existence that are discrete but not independent. They are rather interdependent in the sense that every succeeding unit in the series is causally dependent on its preceding unit in that series, and likewise every preceding unit in the series, in order to be real, has to give rise to its succeeding unit. These two ideas are technically known as pratitya samutpada (dependent origination) and artha kriya karitva (causal efficiency). They constitute the essence of the four Noble Truths propounded by the Buddha. The concept of existence series (kyana santana) is pivotal to Buddhist metaphysics. It explains the reality of incessant change in terms of the causal and dependent origin of the succeeding from the preceding unit in the series. The experience of permanence in the series is also explained on the basis of continuity and dependence. The real is_ always changing, but the change is not random; it is causally regulated. In case of a human being, the series is psychophysical, having a distinct identity of its own. But this poses the problem of memory, recollection, and recognition in every distinct personal identity. Buddhist thought explains these problems also in terms of ksana santana (existence series). 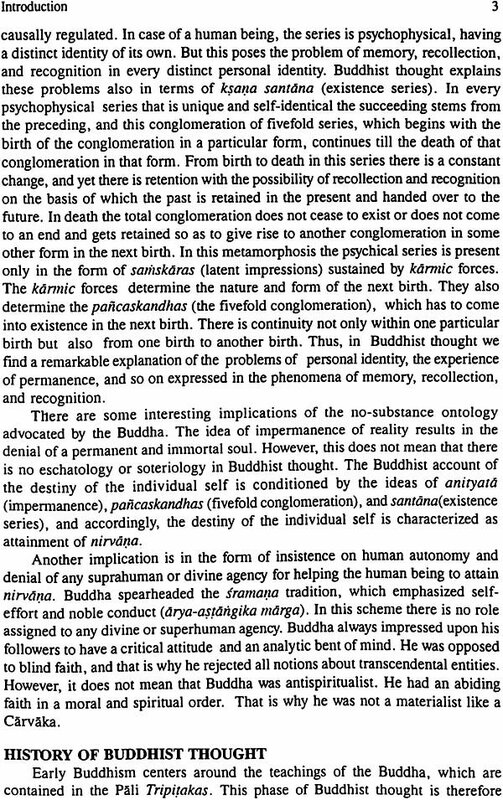 In every psychophysical series that is unique and self-identical the succeeding stems from the preceding, and this conglomeration of fivefold series, which begins with the birth of the conglomeration in a particular form, continues till the death of that conglomeration in that form. From birth to death in this series there is a constant change, and yet there is retention with the possibility of recollection and recognition on the basis of which the past is retained in the present and handed over to the future. In death the total conglomeration does not cease to exist or does not come to an end and gets retained so as to give rise to another conglomeration in some other form in the next birth. In this metamorphosis the psychical series is present only in the form of sathskaras (latent impressions) sustained by karmic forces. The karmic forces determine the nature and form of the next birth. They also determine the paficaskandhas (the fivefold conglomeration), which has to come into existence in the next birth. There is continuity not only within one particular birth but also from one birth to another birth. Thus, in Buddhist thought we find a remarkable explanation of the problems of personal identity, the experience of permanence, and so on expressed in the phenomena of memory, recollection, and recognition. 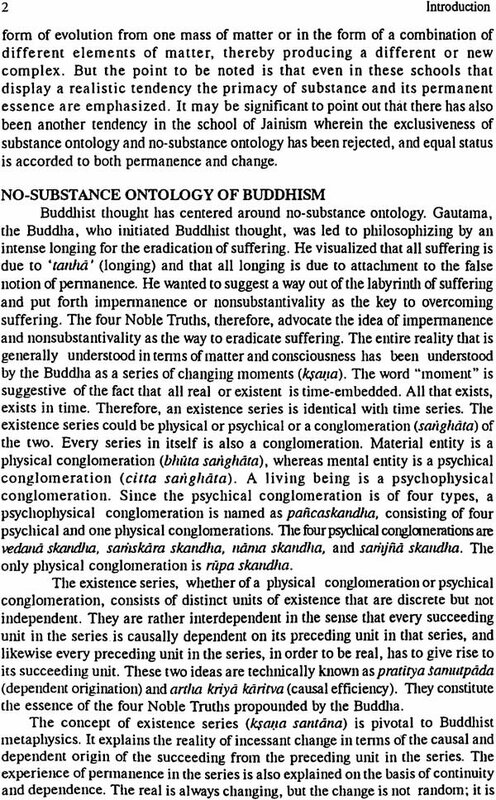 There are some interesting implications of the no-substance ontology advocated by the Buddha. The idea of impermanence of reality results in the denial of a permanent and immortal soul. However, this does not mean that there is no eschatology or soteriology in Buddhist thought. The Buddhist account of the destiny of the individual self is conditioned by the ideas of anityata (impermanence), pancaskandhas (fivefold conglomeration), and Santana (existence series), and accordingly, the destiny of the individual self is characterized as attainment of nirvana. Another implication is in the form of insistence on human autonomy and denial of any suprahuman or divine agency for helping the human being to attain nirvana. Buddha spearheaded the sramana tradition, which emphasized self effort and noble conduct (arya-astangika marga). In this scheme there is no role assigned to any divine or superhuman agency. Buddha always impressed upon his followers to have a critical attitude and an analytic bent of mind. He was opposed to to blind faith, and that is why he rejected all notions about transcendental entities, However, it does not mean that Buddha was antispiritualist. He had an abiding faith in a moral and spiritual order. That is why he was not a materialist like a Carvaka.